Great new for all Chichi & Chacha lover! 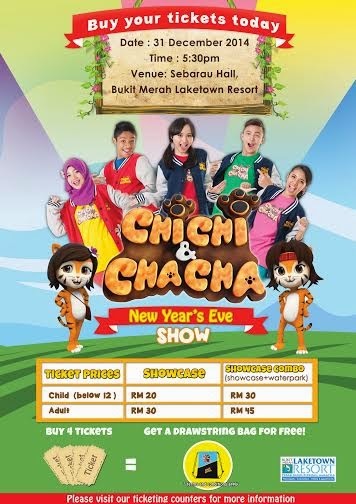 I been told that, Chichi and Chacha will be available LIVE at The Bukit Merah Laketown Resort on 31 December 2014. You able to play, sing and dance with your favourite stars, Chichi and Chacha. Not only that, I been inform that, you also able to meet Atan and Hujan too on this awesome event. Its 90 minutes of non-stop fun and excitement where you can meet and greet all your favourite characters. There’s no better way to end the year than with an evening of song and dance with ‘ChiChi & ChaCha’! Tickets start at RM30 for adults and RM20 for children. Hurry and get your tickets early and receive an additional RM3 discount! So come on down and watch ‘ChiChi & ChaCha’ come to life to celebrate with you “Jom ChiChi, Jom ChaCha”!